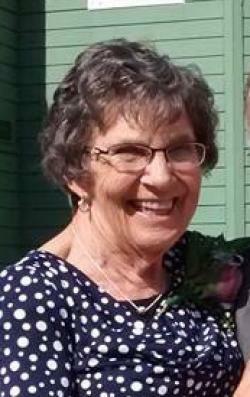 Peacefully at the Prince County Hospital, Summerside, on Thursday, November 1, 2018, with her family by her side, of Rose Marie Gaudet, beloved wife of 62 years to Edward Gaudet of Summerside and formerly of Tignish, age 83 years. Born at Nail Pond, June 15, 1935, she was the daughter of the late Michael and Rosalie (nee Arsenault) Bernard. Loving mother to Kenneth (Lorna) of Charlottetown; Patsy (Jamie) Langille of Williamswood, N.S. ; Rosalie (Maurice) Richard of North Wiltshire; Mary Lou (Dave) Talbot of Lake Orion, Michigan, Ricky (Cindy) of Winnipeg; and Tracy (Blair) Christopher of Margate. She will be sadly missed by her 18 grandchildren and by her 10 great-grandchildren. She is also survived by her many nieces, nephews and friends. She was predeceased by a grandson Derek in infancy, daughter-in-law Kathy, and by siblings, Leonie Gaudet, Cyrus Bernard, Amelia Knox, Anne Gaudet, Gerard Bernard and Velma Knox. She was also predeceased by a brother-in-law, Gerard Gaudet and sister-in-law, Rita Aylward. Resting at the Rooney Funeral Home and Chapel, Alberton. Visiting hours Sunday November 4, 2018, from 2:00 to 4:00 and 7:00 to 9:00 p.m. Funeral Monday morning, November 5th, from St. Simon and St. Jude Church, Tignish, for funeral mass at 10:00 a.m., Rev. John Molina, celebrant. Interment in the church cemetery. As an expression of sympathy, memorials to the Heart and Stroke Foundation or to St. Simon and St. Jude Cemetery Fund would be gratefully appreciated. The Tignish Council of the CWL will hold prayers for their departed member Sunday eveing at 6:45 p.m.
Rooney Funeral Home & Chapel Alberton, P.E.I.